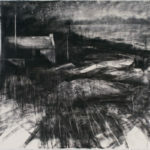 Donald Teskey RHA has completed a series of powerfully atmospheric drawings while in residence in Cill Rialaig, which together with a collection of poems by Sue Hubbard have been published in a book entitled The Idea of Islands, which will be launched at the RHA during the opening on 18 March. Responding to her experiences of Cill Rialaig, Sue Hubbard explores in her poems both the dark and the light within human experience. She evokes the perceived and the actual world through careful attention to the detail of things be it nature, the incidental or the everyday and attempts to give voice to our deepest emotions and our sense of inchoate spiritual longing. Her subjects are those of love, loss and memory. Donald TeskeyÕs large-scale drawings are no landscape idylls. His parallel body of work, complementary to the poems, vividly evoke a powerful sense of that remote and harshly beautiful place, confronting us with the raw forces of nature at the inhospitable edge of the world. A selection of the drawings will be on exhibit in the RHA Atrium, until 25 April and a reading by the poet Sue Hubbard will take place in the gallery, 1 pm Friday 19 March. All are welcome. their peaks in a halo of cloud. the air thick with turf smoke and old rain. See www.suehubbard.com for more information. The Idea of Islands is published by Occasional Press; www.occasionalpress.net. Donald Teskey RHA, Small hours, 2009, Charcoal on paper, 76 x 105 cm, Image courtesy of the artist and the Rubicon Gallery, Dublin. Donald Teskey RHA, In the High Fields, 2009, Charcoal on paper, 105 x 150 cm, Image courtesy of the artist and the Rubicon Gallery, Dublin.